Summer may be over, but there are still plenty of potential gardening projects on the horizon. Greet the new season by getting a head start on cold-weather planting and maintenance. 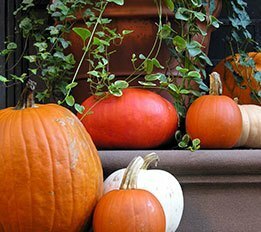 Autumn is an important, enjoyable gardening season; its moderate temperatures and heavy rainfall mean that plants experience extensive root growth in the fall. Take the opportunity to get outside and encourage your plants’ maturation. While the weather is still warm, before you have to worry about falling leaves and snow, cap the summer season off right by engaging in some maintenance and clean-up. Clean, sharpen, reorganize and restock your garden supplies with the fall and winter months in mind. Remove debris and unsightly branches, tidy things up, and refresh your mulch so you can begin autumn with a fresh start. Thankfully, there’s one chore you can continue to avoid. Hold off on pruning for now; at this point, new growth would be too vulnerable to survive the upcoming cold weather. Lawns experience a lot of traffic over the summer, so they may require some help by this time of year. Weight on top of lawns causes the soil underneath to compact, blocking air, moisture, and nutrients from reaching roots. You know that your yard could use some aeration once water starts to accumulate and pool on top of the grass. To do so, simply prod the ground with a garden fork every few inches to loosen the soil. It may be necessary to rent a walk-behind aerator if you’re dealing with a lot of land. Container plants could also use some attention in the fall. Gather cuttings from annuals to make them last longer. The lifespans of tropical plants can also be extended if you bring them inside before the weather takes a turn for the worse. Meanwhile, perennials can be transplanted from containers into the yard itself. Herbs can be harvested and dried or moved inside, provided that they have access to light. Many plants need to be started now so they have time to establish themselves before winter temperatures, winds, and storms become threats. Get in the autumnal mood by stocking up on new plants and produce. ‘Tis the season for trees, shrubs, and cold-weather perennials. Mums, aster, and pansies can give your garden a burst of fall color. Cool season grasses, such as rye grass, should also be planted in the fall. It’s about time for hearty vegetables as well. If you’re feeling ambitious, plan and execute a cold-weather garden brimming with lettuce and other greens, carrots, broccoli, cabbage, cauliflower, Brussels sprouts, turnips and potatoes. Some varieties of spring bulbs can also be planted now, so have some fun preparing for next year’s display. Before the leaves begin to fall, take a look at your mower and make sure that it’s in good working order. Mowing may feel like a chore, but it’s good for your lawn. Mowing gives beneficial worms access to leaf material. Soil and tree roots are enriched in the process. Eventually, leaf fall may become too overwhelming to mow, however. To prepare yourself, make sure that your compost pile is ready for the onslaught. Kill two birds with one stone by using up the bulk of your already-prepared compost in the early fall, adding it to flower beds, as well as to the bases of trees and shrubs. This way, you ensure that your plants will be strong enough to face the colder months and your compost pile will be low enough to accommodate fall leaves. Speaking of birds, they are natural predators of harmful garden insects, so remember to feed your feathered friends so that they’ll stick around for another season.